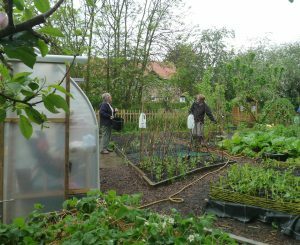 The Sleeper Path Community Garden and Allotment is a lovely community garden and allotment near the centre of New Earswick in York. Children have compared it with Mr Bloom’s Nursery and The Secret Garden. We grow a large assortment of fruit, flowers and vegetables in our raised beds and polytunnel, have a pond and dipping platform, a living willow dome, a sandpit and lots of seats. During the growing season, we sell our produce at the garden gate to help boost our funds. It is run by a local voluntary group called NEST (New Earswick Sharing Together). NEST encourages sharing by welcoming people to join in caring for the Sleeper Path Community Garden and Allotment, and by organizing other practical, communal, hands-on projects and activities for the benefit, enjoyment and recreation of the local community. NEST has its origins in the Transition movement, and hopes to help make New Earswick and its neighbourhood a more sustainable and resilient community. You will find us at the bottom of Station Avenue, just over the River Foss bridge, through the green gate on the left. If you are coming by car, our postcode is YO32 4BN. Or by bus, numbers 1 and 13 stop at the Folk Hall. Cross over the road and walk down Station Avenue. Or, preferably, to save the planet, come on foot or by bicycle! 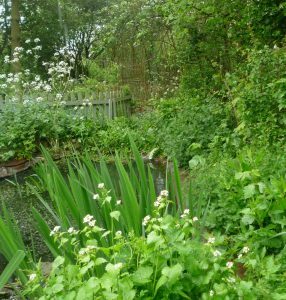 We open the garden at the Sleeper Path Allotment site on Wednesday mornings from 10.00 to 12 midday. During the coldest months, we can’t guarantee to be open but we will try our best. We also open on the second Sunday of each month from March to October from 2.00 to 4.00pm. Everyone will be very welcome whether you want to help us work or just enjoy the lovely garden allotment. Children must be accompanied, but will find lots of exciting things to do.